I started the day off in Nottingham. As I was walking from the hotel to the train station, I must have looked lost (and I sort of was) because two women stopped to ask me if I needed help finding something. I told them where i was headed and one of them walked me to the train station as she happened to work in a building right across the street. People are so friendly here! My trains into Reading were delayed by about a half hour but I made it to the University of Reading campus. I was treated to lunch by the researchers there and we shared our respective games that we had developed. I think we will definitely be collaborating in the future. A quick (and direct!) train ride later I was in London at Paddington Station. I’m getting pretty good at this train thing. 🙂 A short underground ride over to London St Pancras station for the Eurostar. The Eurostar train was awesome. It took me from London to Brussels in just 2 hours, with a stop at Lillie Europe station in France. I had dinner on the train and then caught a taxi to Courtney’s house. It is great to see her and we spend at least an hour catching up and sharing stories. Both she and her husband work for the State Department. Her husband is still in the military so he works at the Consulate in a military position. Courtney works for the EU Ministry in the Fulbright area. She has her Masters in Education so she works a little bit of admin but mostly works on the Fulbright Scholar program there. They have a wonderful house in Brussels and two very adorable little boys. Oliver is a little over three and Liam is just about 3 months. Unfortunately since they are pretty much still considered Americans (taxes, health care, etc. ), she only had 8 weeks of maternity leave as opposed to the 6 or so months Belgian citizens can take! After their three years are up here, they will be headed to Shanghai, China. Her children will be very well traveled and cultured. Tomorrow I will catch up on sleep, work and most importantly, DO LAUNDRY! Valerie and I visited the University of Nottingham today. It was a long, packed day but very productive for us! We met with several researchers in their Rehabilitation and Ageing Division at the University. They have been able to infiltrate at the National level in stroke research and have been promoting OT interventions and pushing forward the standard for research. We have a lot to learn from them. Both us presented our current research and got some wonderful feedback. One of the researchers, a psychologist by clinical background, runs a lab developing game and VR for stroke rehab as well. She toured us around her lab. They approach stroke rehab interventions in a similar way to us and it’s very refreshing to see research that is solid and built on the same principles. I hope to collaborate with them in the future! We left the University and came to the City shopping centre. I found an outdoors store (sort of like a much smaller REI) and picked up a decent jacket (rain and windproof) for about $45. 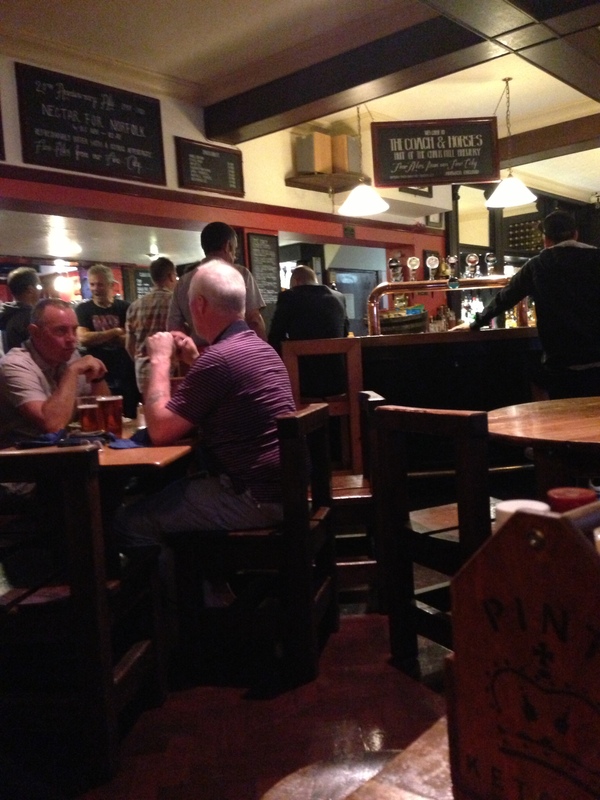 We then wandered towards our hotel and stopped into a pub for dinner. I couldn’t leave England without having fish and chips!! We’re now catching up on work and reflecting on the day. It was a very promising day and we’re looking forward to what we can achieve with the connections we now have. Tomorrow I will be writing from Brussels (and uploading pictures!)! I began the day with another lovely B&B breakfast including tea. The researchers I met with today provided a car to take me to campus. Along the way he pointed out various landmarks in the city including the castle and cathedral. I felt like I had my own tour guide! After the presentation we had lunch. I chatted with a few more people had some great discussions about what to measure in terms of outcomes and thinking about my research more from a functional perspective, more similar to the tenants of OT. After lunch, I met with the early career investigator group and shared with them the process of moving from doctoral work to postdoc funding to K level funding and obtaining a faculty position. I had some time to check email before heading to the airport. I had about an hour and a half before my train so my driver took me on a tour of the city. We stopped at the cathedral and I got out and walked around while he “had a fag”. He also drove me down the oldest street in Norwich and followed behind me in the car while I walked and took pictures. Upon arriving to the train station, I realized I had left my jacket at he university. I will have to buy one here for the remainder of my trip and have them mail my jacket home unless they can mail it to me in Brussels. We’ll see. I at least have my backpacking poncho so I can stay dry until I get another jacket. On the train to Nottingham, a family of 5 was in the table seat in front of me. Three blonde headed kids, one older boy and two girls. They all had activity books and one of them had riddles in the book. I was listening to them do some (what gets bigger the more you take away? answer: a hole) and then chimed in with a few of my own (what gets wetter as it dries? answer: a towel, and the patient who is the son of the doctor but the doctor is not his father). The older boy got both of them after some pondering. I took a taxi to the hotel and checked in. Valerie and I (another postdoc from USC) are sharing a room. Tomorrow we’re off to the University of Nottingham. The internet is not fast enough for me to upload pictures so I’ll do that another time. I have a ton from today. Good news! There is Wifi at the B&B here. 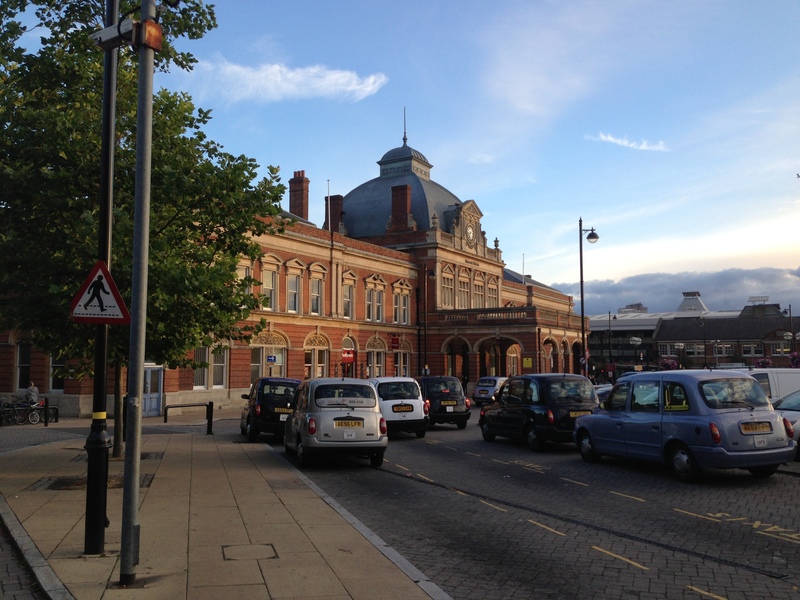 I arrived into Norwich station around 6:30pm. 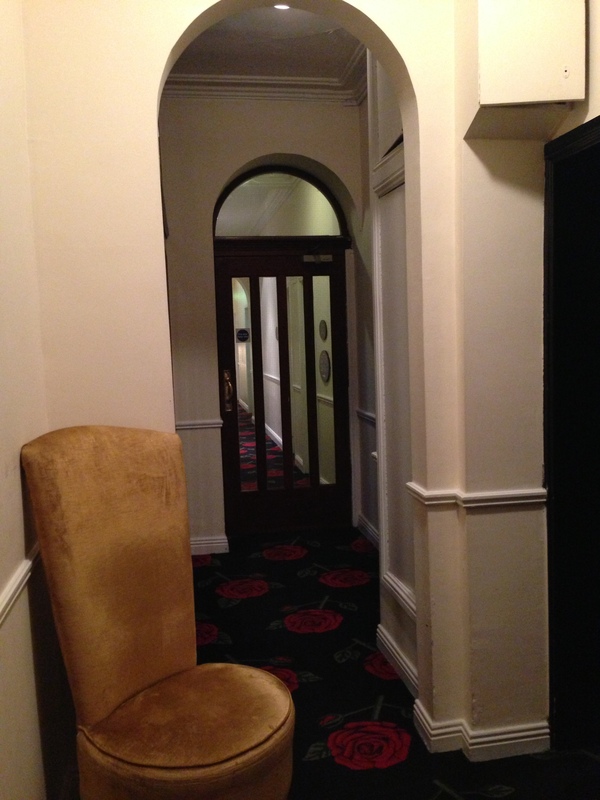 The Abbey Hotel B&B was a short 5 minute walk from the station. 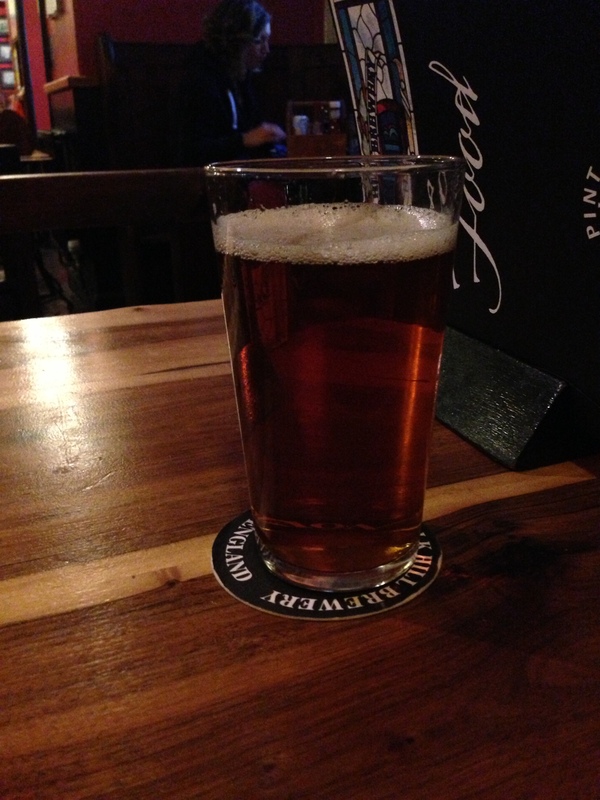 After settling in, I walked down the street to a local pub for dinner. With the local brewery not far from it, the pub serves local craft beer. http://www.thecoachthorperoad.co.uk/the-coach-brewery.html I had the Chalk Hill Best and it was wonderful. The beer is still good served a little bit above fridge temperature. I’m now brushing up on the researchers I will meet tomorrow and hitting the hay. Good night! My room on the 3rd floor. Shared bathroom again. Today was a full day of travel. I started early in the morning from Dublin (read 6am) and caught a taxi to the ferryport. I took the Swift ferry into Holyhead. 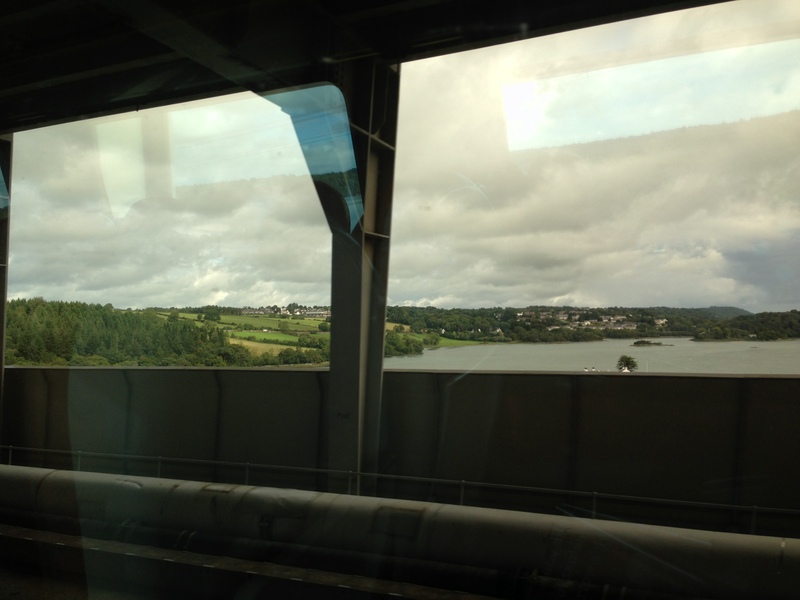 It was overcast and raining but once out of Holyhead on the train, the weather cleared up. This is what I look like while traveling. One in front, one in back! 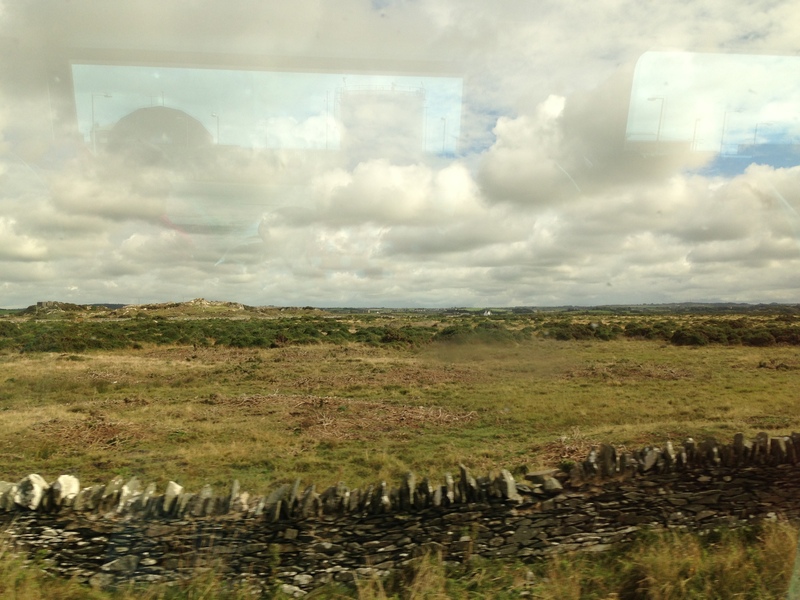 The train from Holyhead to London was about 4 hours and I had some beautiful countryside scenery to take in. The hills truly are rolling and covered with cattle, sheep and horses. 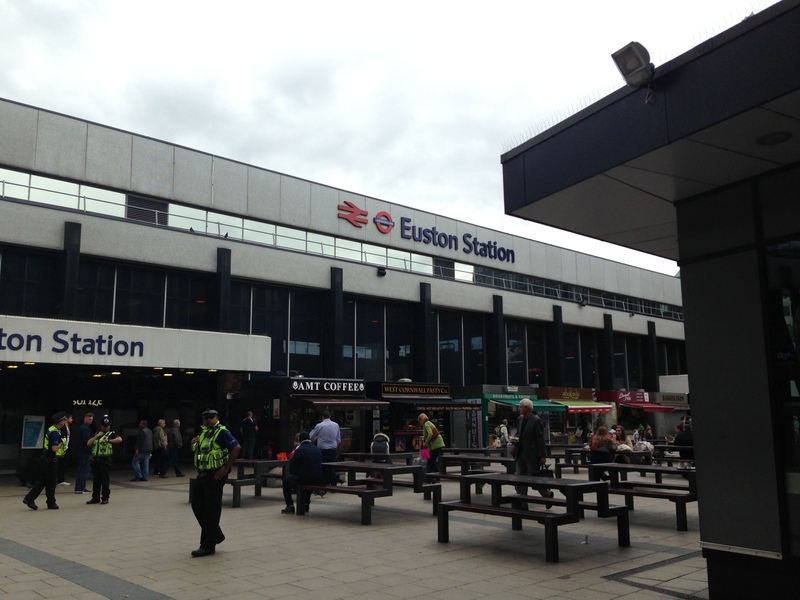 I arrived into London Euston Station, walked a brief walk to the Euston Square Underground station and took the tube to Liverpool Street Station. 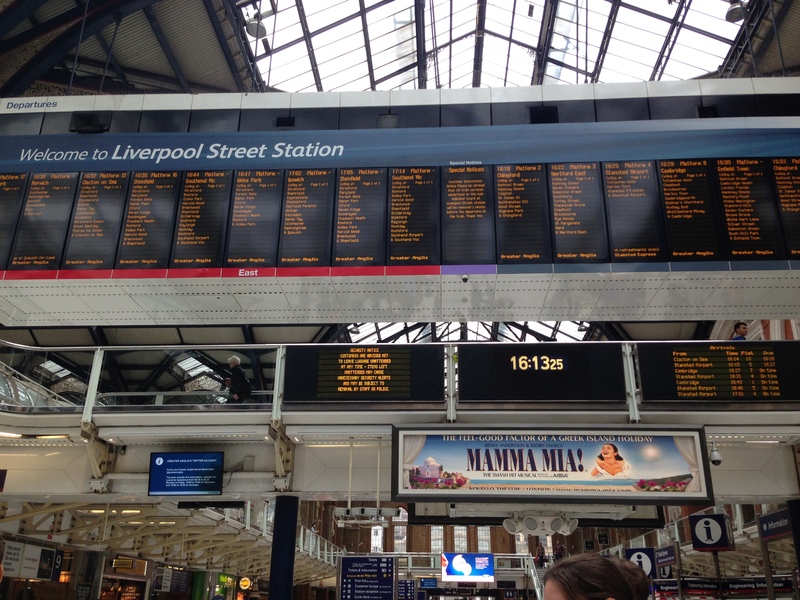 Liverppol Street Station. So pretty. This station functions similarly to Penn Station. 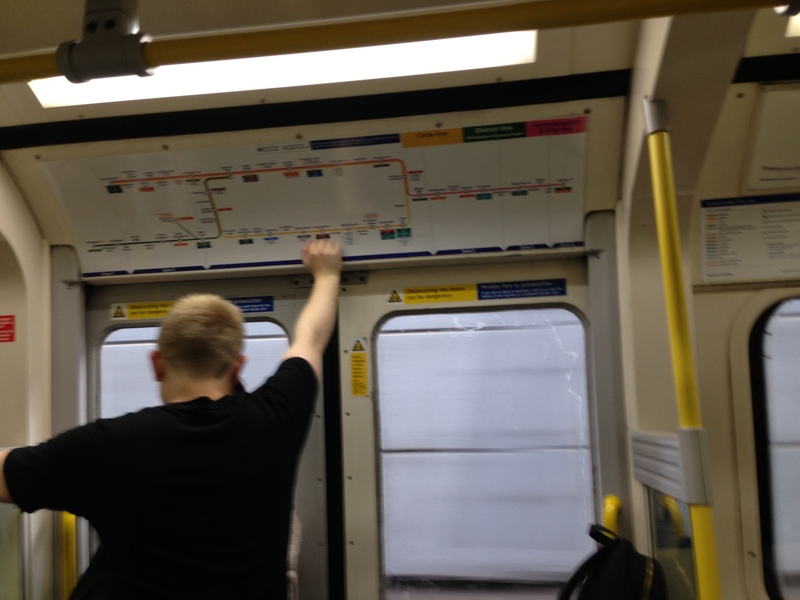 It has trains going out to larger cities outside of London and also connects directly to the Underground. You stand around and wait for the track to be announced, just like the LIRR. 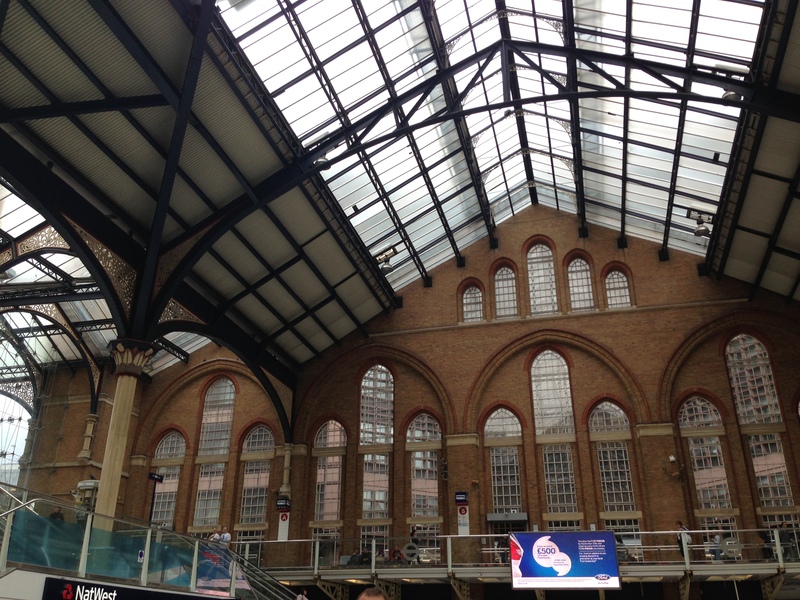 Once there, it was not a long wait to hop on a train to Norwich. 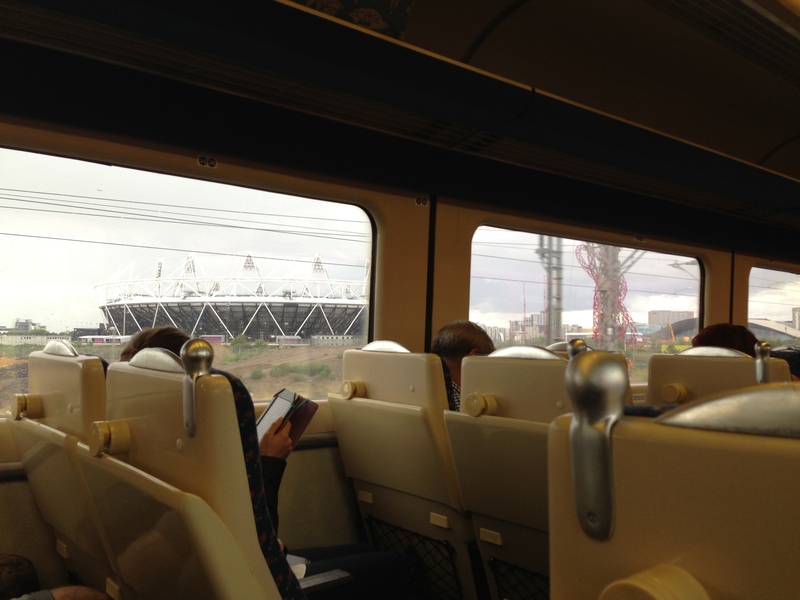 On both train journeys, we passed by some of the Olympic venues from the 2012 games. I’m currently on the train on Wifi and I’m not sure if the B&B I’m staying in tonight will have Wifi available. It is a small family fun place so you never know. Tomorrow I’m off to meet with researchers at the University of East Anglia. Today was the second full day of conference. I packed up and checked out this morning from the B&B and had a third amazing and filling breakfast. This time I ordered pancakes. They make them very thin, almost like crepes but without any filling. The conference sessions were very thought-provoking this morning. After lunch I Skyped with Justin and got to say hi to the doggies. 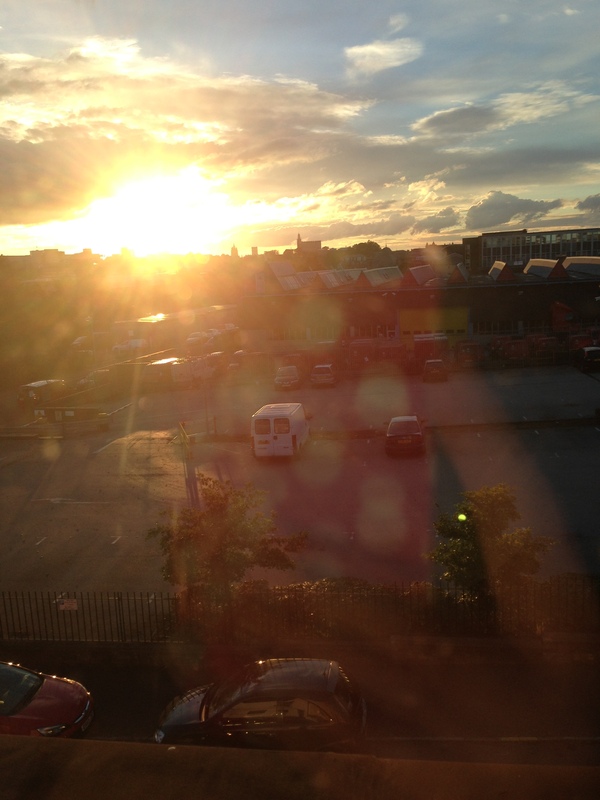 I just made it to catch the AirCoach bus back up to Dublin. One of the other conference attendees lives in Dublin and she was on the same bus. She gave me a bit of a tour of some of the sights along the drive, such as the bogs, watchtowers, and hillsides full of sheep. She also helped point me in the right direction from the bus stop in Dublin and even offered to let me stay with her and her husband if the hostel was too seedy or full. Irish people are so very welcoming! I’m currently at the hostel right now. 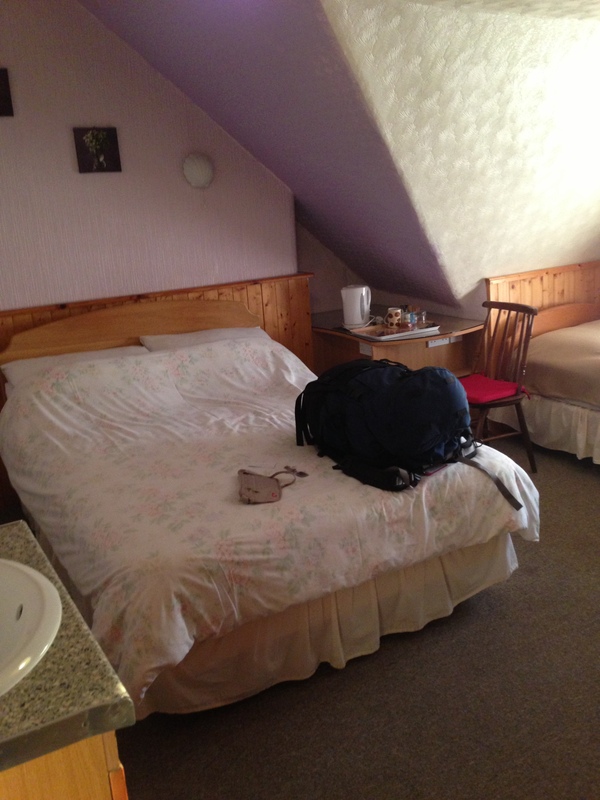 I had booked a bed in an 8 bed shared dorm but it was full when I arrived. 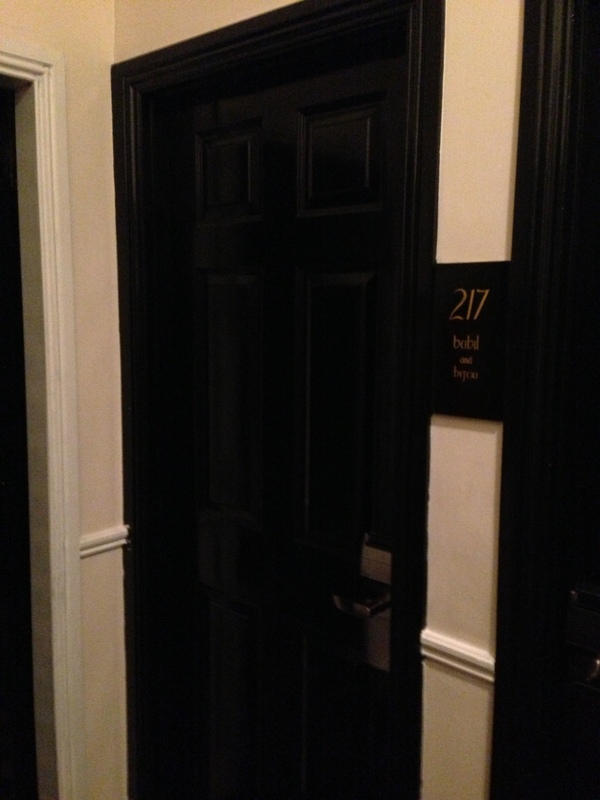 They offered me a single room at the same rate. This room normally goes for about $80 and I’m only paying $26! It shares a bathroom with 4 other rooms but there is a sink in my room. I went out and got a bite to eat and bought some granola bars for breakfast in the morning (I leave around 6am). I also washed my traveling pants as they were starting to get kind of funky and the bottoms were wet from walking in the rain today. I sure do miss the Southern California sunshine. But I don’t miss the 100 degree weather right now! I’m currently sipping some tea and nibbling on dark chocolate. It’s quite quaint here but people are always on the go, even in the rain. Tomorrow is a long day of travel starting early so I’d best get to sleep. Tomorrow I will be writing from Norwich, England! Today was the first full day of the Occupational Science Conference. The keynote this morning was given by a Professor Emiratus from USC who is very well known in the field. I chatted with her a bit last night. She is very sweet. She has retired to the Sierra Mountains and enjoys her more simple life away from Los Angeles. Tonight was the conference dinner/gala. I chose to have the steak which was 100% farm raised Irish Beef. Needless to say, it was amazing and cooked to perfection. And as always, it came with potatoes on the side. For dessert we were treated to two guys singing traditional Irish music. They did slip in a few non-Irish songs, such as “Taking It Easy” by the Eagles. I think that song sounds better with a slight Southern twang. I captured a video of part of one song. It was still fairly noisy in the background but you can at least hear the guy singing. Enjoy! !